You have 100 reasons for losing motivation to run. But we can top ’em with tips, inspiring quotes, and more. Pick your fix. Repeat as necessary. 1. CREATE A BLOG where you post your daily mileage, then give out the Web address to your friends and family. Do you really want Aunt Ellen to ask why you skipped your four-miler on Wednesday? 4. GO SOFT. It’s hard to stay motivated with shinsplints, so get off the pavement for a few days and run on a cross-country course or unpaved bike paths. 5. LOOK TO THE PAST Emil Zatopek, who won four Olympic golds in his career, was a tough-as-nails athlete known for his intense training methods, such as running in work boots. Competing with a gland infection and against his doctor’s orders, the Czech won three distance events–including the marathon–at the 1952 Helsinki Olympics. That stuffy nose doesn’t seem quite so bad now, does it? 6. FORGET TIME. Shane Bogan, who coaches distance runners in the Washington, D.C./Baltimore area, advises leaving your watch at home once in a while. “It’s liberating not to be worried about pace,” Bogan says. 10. BLAZE A NEW PATH. “If you do the same runs all the time, it can beat you down,” says Olympian Alan Culpepper. GPS systems work great for mapping new routes. Or check out favoriterun.com or usatf.org/routes, which use Google Maps to let you plan and save routes. 11. FILL THE TUB with hot water, then head out for a three-miler on a frigid morning. The sooner you get back, the hotter your bath is. 15. RACE ODD DISTANCES FOR AN INSTANT PR. 16. READ THIS The Loneliness of the Long-Distance Runner, a short story by Alan Sillitoe, tells the tale of a rebellious youth in a reformatory who runs in solitude and makes a stand against a system he doesn’t believe in. You’ll have new appreciation for the power of solo runs. 18. THE PILE OF DISHES in the sink can wait till the sun goes down. Your tempo run can’t. 20. RUNNING COMMENTARY “The more I run, the more I want to run, and the more I live a life conditioned and influenced and fashioned by my running. And the more I run, the more certain I am that I am heading for my real goal: to become the person I am.” –George Sheehan, M.D., beloved former RW columnist. 21. THAT NEW RUNNING WATCH you want? Buy it–after timing 10 more speed sessions with your old one. 22. WATCH THIS Chariots of Fire In this stirring 1981 Oscar winner for Best Picture, two British athletes prepare for and compete in the 1924 summer Olympics. For bonus motivation, download the famous Vangelis theme to your MP3 player for tomorrow’s run. 24. BUDDY UP. Not many people can keep up with nine-time University of Colorado all-American Sara Slattery. Luckily, two-time Olympian Shayne Culpepper happens to live down the street. Find your own version of the Olympian next door to run with regularly. 25. LOOK TO THE PAST In 1949, 9-year-old Wilma Rudolph learned to walk without leg braces after suffering from polio and spending most of her first years in bed. Rudolph went on to win three gold medals in the 1960 Olympics. 26. HAVE A DAILY GOAL. Scott Jurek, seven-time champion of The Western States 100-Mile Endurance Run, sets goals not just for big races but also for workouts. “Maybe it is a technique goal, maybe a pace goal, maybe a goal of running faster at the end,” he says. 28. WATCH THIS Baseball had Babe Ruth. Basketball had Michael Jordan. American distance running had Steve Prefontaine. Doesn’t matter that he wasn’t the best ever–he was the sport’s rock star. Prefontaine (1997) and Without Limits (1998) both capture Pre’s cocky swagger. Or check out the 1995 documentary Fire on the Track: The Steve Prefontaine Story. 29. GET YOURSELF A HEARTY DOG who needs lots of exercise. You’ll always have a reason for a daily jog. 31. RUN THROUGH A SPRING STORM. With rain hitting you sideways and the wind whipping your face, you’ll feel alive. Just make sure you have a dry pair of shoes for tomorrow. 32. READ THIS The cult classic Once a Runner, by talented runner John L. Parker JR., captures the hard work and dedication required of fictional collegiate miler Quenton Cassidy. 35. FOR EMERGENCY USE ONLY: Consider taking a short break from running if you think you’ve got the beginning of an overuse injury or you’re truly fatigued. A couple days of rest may be the thing to reinvigorate you. Call this one instant running motivation for three days from now. 36. IT’S SPRING! Why are you even reading this? You should be motivated just by the fact that you’re not forced to run on a treadmill. 37. YOU’LL BE WEARING A BATHING SUIT in another month or so, won’t you? 40. IT’S NOT TOO LATE to salvage your New Year’s resolutions. 41. READ THIS Pain, by Dan Middleman. Fictional college senior Richard Dubin attempts to balance hard partying, a complicated relationship, and world-class competition. 42. GO EARLY. Two-time Olympian Shayne Culpepper says that rather than putting off a run, she’ll head out even earlier than usual when she’s not in the mood to work out. “If I have that extra cup of coffee or I wait an extra half hour, it becomes too torturous,” she says. 43. LOOK TO THE PAST Billy Mills came out of nowhere in the 1964 Olympics to become the only American to win a gold medal in the 10,000 meters. Mills’s PR at the time was nearly a minute slower than that of Australia’s Ron Clarke. With 100 meters to go, Mills sprinted ahead, improving his PR and setting a new Olympic record. 44. IF YOU’RE REALLY IN THE MOOD to change things up, or if you just have nothing to wear, check out the list of clothing-optional races at cybernude.com/nuderuns. 46. PAY YOURSELF. 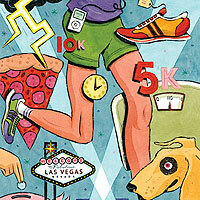 Set a price for attaining a certain weekly mileage goal. When you hit it, pay up. Keep your mileage money in a jar, and once it accumulates, buy yourself that new running jacket you’ve been ogling. 47. ASK A FRIEND TO BIKE alongside you when your running partner isn’t available. 51. BEEN MARATHONING FOR YEARS? Maybe it’s time to try an ultra. Or the mile. 52. BECOME A RUNNING MENTOR. Once you get your neighbor, coworker, or significant other hooked on your favorite sport, they’ll be counting on your continued support and guidance–and company. 54. HEAD FOR THE HILLS. “When I need a boost, I attack a hill workout,” says Greg Meyer, winner of the 1982 Chicago Marathon and 1983 Boston Marathon. “You can’t do hills halfhearted.” Meyer believes the difficulty of the workout brings out the best in him. 55. WATCH THIS Saint Ralph In this 2005 Canadian film, a teenager sets out to win the 1954 Boston Marathon, thinking this is the “miracle” required to wake his mother from a coma. 57. DUST OFF YOUR TRACK SPIKES. Most states have Olympic-style summer games where you can compete in events like the mile or the 400-meter hurdles. If you’re really looking for a change of pace, train for a field event like the long jump. 60. LOOK TO THE PAST Roger Bannister and John Landy (the only two men to have broken four minutes in the mile at the time) raced at the 1954 British Empire and Commonwealth Games in Vancouver in what was billed as “The Miracle Mile.” Landy led for most of the race, but Bannister passed him on the final turn–proving it ain’t over till it’s over. 62. KEEP A LOG. Greg Meyer, former Boston Marathon and Chicago Marathon champ, says his logbook keeps him motivated. “I just can’t stand to look at my log and see a goose egg for the day,” he says. 63. MAKE A CONNECTION. www.Fitness-singles.com connects active people looking for love. Get in your run and go on a date at the same time. 64. BRING HOME SOME HARDWARE. Okay, so you’re not going to win the Chicago Marathon, but that doesn’t mean you can’t score a trophy. Find a few small local races where you might be able to compete for the top spots in your age group. 65. DON’T EXPECT EVERY DAY TO BE BETTER than the last. Some days will be slower than others, and some days might even hurt a bit. But as long as you’re on the road, it’s a good day. 66. IF YOU DON’T RUN ROAD RACES, where will you get all your T-shirts? 67. JUST START. If the thought of running your full workout is too much to bear, just suit up to run around the block. 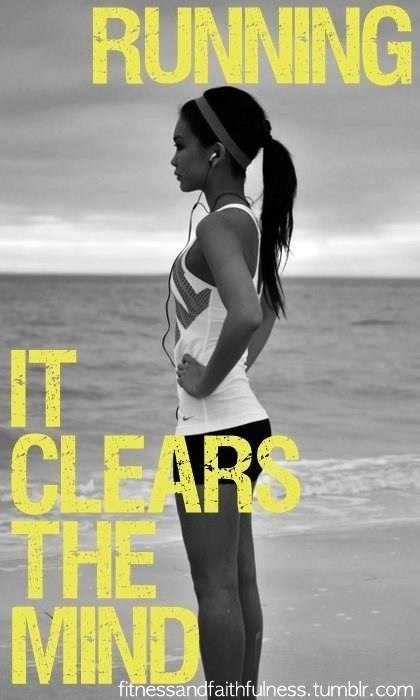 Chances are, once you’re outside, you’ll start to feel better and put in at least a few miles. 68. READ THIS Bowerman and the Men of Oregon, by Kenny Moore. Learn about Bill Bowerman, one of the most famous track and field coaches of the last century and cofounder of Nike. You’ll be surprised how the legend initiated his new runners at the University of Oregon. 69. RUN SOLO and away from the crowds on recovery days. The faster runners on popular routes will make you want to pick up the pace. Alone, you’ll be able to listen to your body and reap the recovery you deserve. 71. YOU’RE NEVER TOO OLD FOR A GOLD STAR, says Sacramento-area running coach Shauna Schultz. Plan your workouts a week in advance, then place a star sticker on the calendar for each day you meet your goal. “Visualizing your progress in this manner is very encouraging,” Schultz says. 72. THINK YOU DON’T HAVE TIME TO RUN? You can probably make a list longer than this one of things you’re wasting time on today. Cut one of them out and get the run in. 75. RUN AN ERRAND–LITERALLY. Run to get cash at the ATM, buy that lottery ticket for the mega-million-dollar prize, or return the DVD to the rental store. 76. CHECK WEATHER.COM. If you know it’s going to be 110 degrees by 2 p.m., run early in the morning. Terrible thunderstorms on Saturday? There’s your day off. Proactive scheduling now will give you fewer excuses later. 79. WATCH THIS Endurance. This 1999 docudrama shows how Ethiopian Haile Gebrselassie became one of the best distance runners of all time. 80. CREATE CONFLICT. Drew Ludtke, head women’s track and cross-country coach at the University of St. Francis in Joliet, Illinois, says his runners are sometimes too social. So he tells them to imagine that the runner next to them just stole their boyfriend, which amps up the competition–and the fun. 81. RUN TRAILS to challenge your body and mind. “Trails are a fantastic way to give your training a change of pace,” says Long Beach, California, coach Todd Rose. Rose advises always running trails with a partner and a cell phone to stay safe. 88. READ THIS Life at These Speeds, by Jeremy Jackson. When an entire track team is killed on the way home from a meet at the beginning of this novel, star Kevin Schuler, who rode home with his parents, is left to pick up the pieces. Sad but stirring. Leave the MP3 player at home and see how you like it. Sometimes, the rhythm of your own breathing is the most inspiring thing of all. 90. BUY GOLD RACING SHOES. With those on your feet, you’d better be fast. It worked for Michael Johnson. 91. KEEP LOOKING FORWARD. It would be easy for Maurice Greene, 100-meter gold medalist at the 2000 Olympics, to rest on his laurels. “People always ask me, ‘Why do you keep on going?’ I always say, ‘I believe I haven’t reached my full potential. '” Greene’s current goals include another Olympic gold and a time of 9.67 seconds in the 100–which would currently earn him back his world record. 93. TRY A TRI. Logging a chunk of your weekly miles in the pool and on the bike for a triathlon can reinvigorate your mind and body–and running. 96. A HEALTHY RUNNER IS A HAPPY RUNNER. As soon as you feel like you might be coming down with something, pamper yourself: Eat more healthfully (think lots of fruits and veggies) and get extra rest. A little prevention today means you won’t be debating next week whether you’re too sick to run. 97. LISTENING TO YOUR FEET crunch gravel for an hour can erase a day’s worth of stress. 99. BE CREATIVE. If the idea of going on your regular four-miler just sinks you further into your recliner, remember that there are other ways to put in some miles–like a pickup game of soccer, flag football, or ultimate Frisbee. A soccer midfielder runs up to six miles in a regulation 90-minute game. This entry was posted in Running Motivation and tagged Running Motivation.